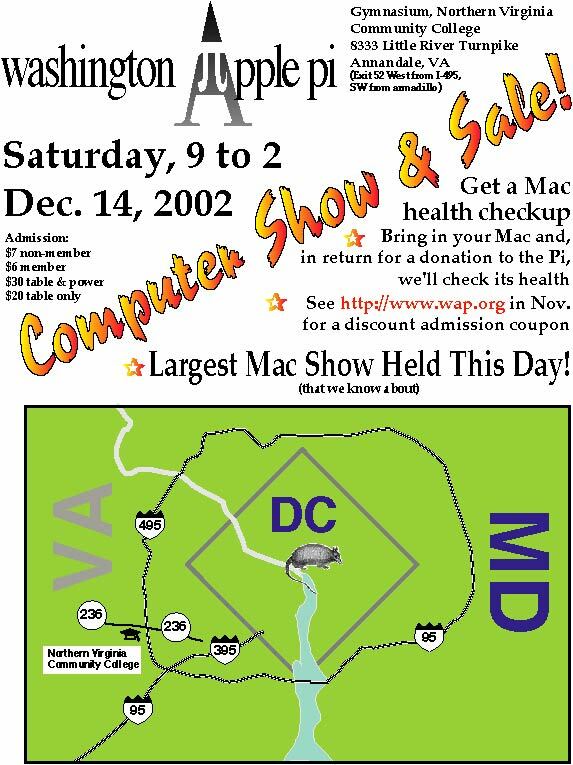 That's right: the special limited edition Washington Apple Pi Computer Show & Sale will be held December 14, 2002, from 9 a.m. to 2 p.m., in the gymnasium of Northern Virginia Community College in Annandale, Virginia. We have a commemorative poster, suitable for framing and passing on to generations yet unborn, available in Adobe Acrobat (.pdf; 364K) and JPEG compressed (99K) format. The poster includes a map. Those wishing to volunteer for the event (setup will be Friday, Dec. 13, show Saturday, Dec. 14) should please contact the garage sale czar to see what needs to be done and when. For those wishing a discount on admission (there's always someone), a coupon is available (in JPEG, 115K, or Adobe Acrobat PDF, 11K), but only if you are a special person. Print it out and display it at the door, or bring it in displayed on the screen of your laptop. 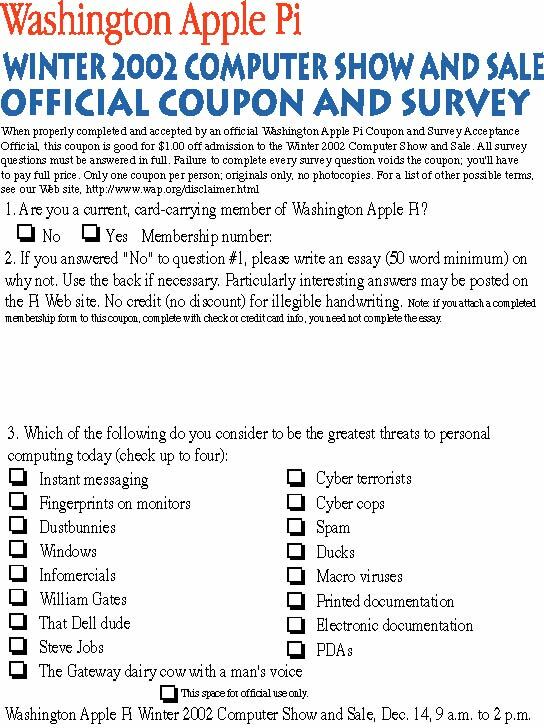 As always, everyone donating a few pounds of solid gold to Washington Apple Pi will get free admission. Be sure and pay close attention to all the terms and conditions concerning use of the coupon and related matters.